There is no better way to wrap up a magical day at the Disneyland resort with a stay at the majestic and fairy-tale castle-like Disneyland Hotel. With its beautifully-manicured gardens (there is even a Mickey maze) and adequate facilities e.g. gym, swimming pool and even multi-purpose court, there are lots to keep you occupied at this hotel. Also located inside are amazing restaurants e.g. the Crystal Lotus Restaurant and Enchanted Garden Restaurant (where you get to enjoy your breakfast with Disney characters). If you are participating in the Star Guest programme, do remember to put on your Star Guest lanyard because there will be exclusive surprises all around e.g. you could get to make your favorite song dedication with the in-house pianist. 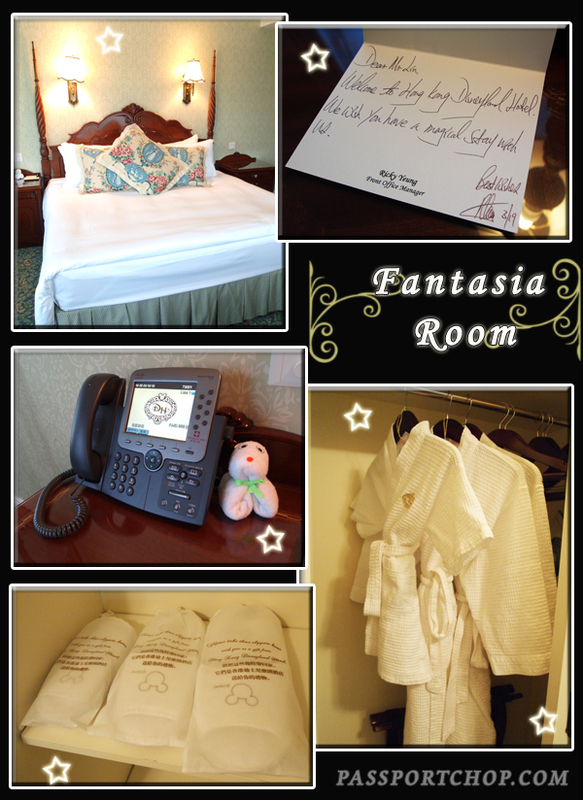 We stayed in the Fantasia Room – a very spacious room with a comfortable King size bed. This room is perfect for a weekend family outing with smaller bathrobes and slippers catering for the little one. We were also warmly greeted with a note wishing us a magical stay at the hotel and surely enough, we were not disappointed. For a view of what the room is like, scroll along the panorama picture below. Besides in-room broadband internet, there are also flat screen TV, study desk and even a sofa which doubles up as a bed. And the above description was just for the room, the bathroom is another huge space with jacuzzi and a rainforest-style shower. 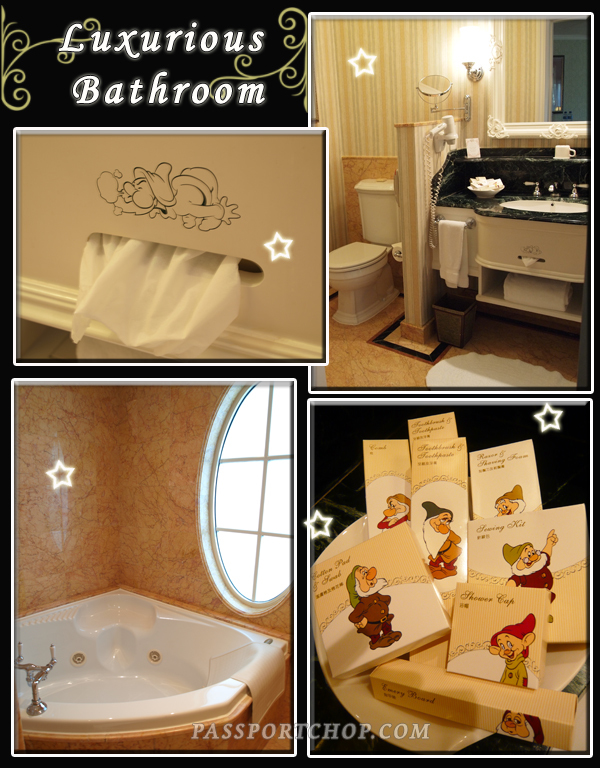 Even the shower gel, shampoo and conditioner are packed in cute Seven Dwarfs boxes – totally enhancing the magical-ness of staying in this Fantasia Room. 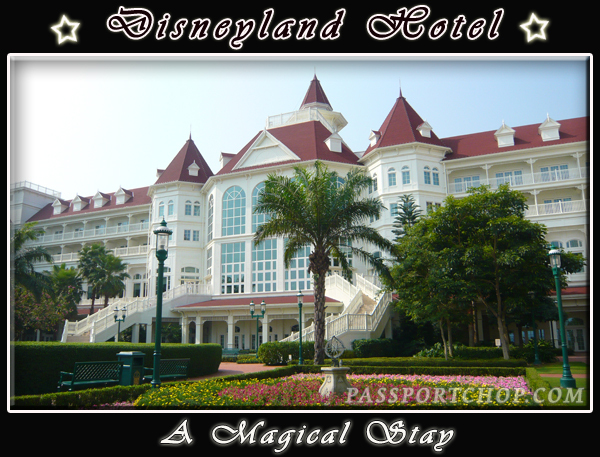 The best way to spend the evening after a long day in Disneyland, is to take a stroll around the magical and romantic gardens of Disneyland Hotel amidst the cool breeze from the sea.